Misogyny and its awkward, uncomfortable, and—let’s be honest—pretty tiresome existence in the present day is making big waves right now. Whether you are for or against the premise or promise of #MeToo and Hollywood’s campaign, or the difficulties and definitions within Aziz Ansari’s recent dinner date, there’s a great deal of healthy conversation about women and men and history and change happening throughout creative industries in 2018. Adding to that dialogue is a fresh series of photographs dreamt up by Lebanese artist and founder of , . 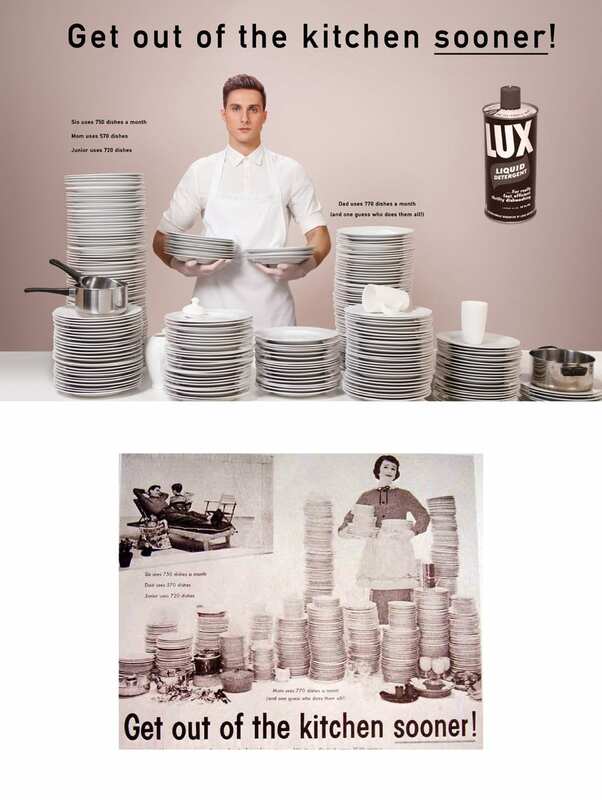 The nine-part series features a collection of fictional advertisements, refashioned from real print ads torn from the Mad Men era. 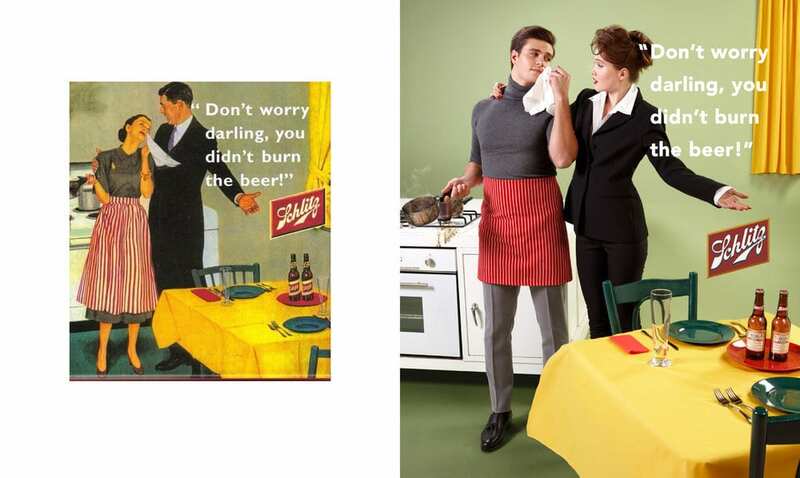 Titled ‘In a Parallel Universe’, Eli has reversed the gender roles in each by swapping pronouns and inserting a doting, doe-eyed husband in place of an aproned housewife. “Last Thanksgiving, I overheard my uncles talk about how women are better off cooking, taking care of the kitchen, and fulfilling ‘their womanly duties’. 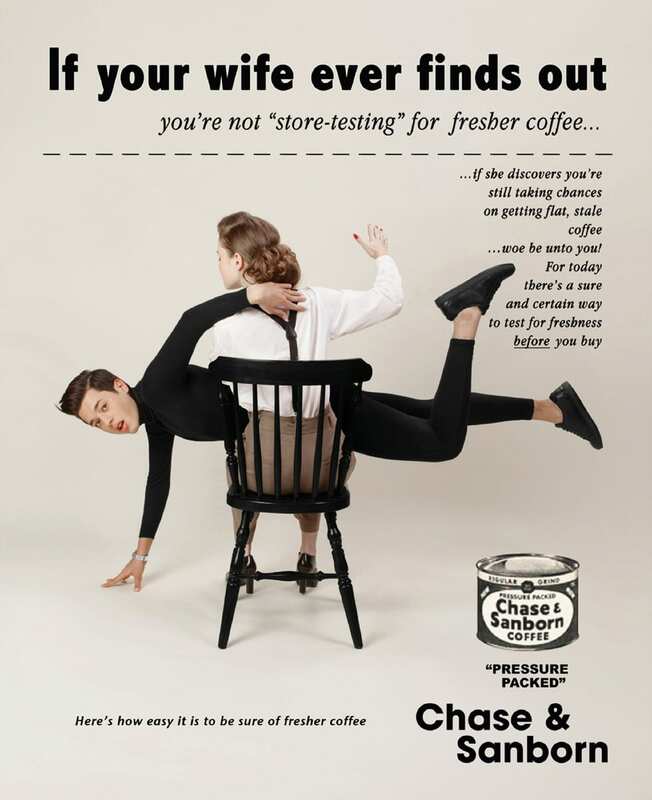 Although I know that not all men like my uncles think that way I was surprised to learn that some still do, so I went on to imagine a parallel universe, where roles are inverted and men are given a taste of their own sexist poison,” Eli wrote on his website. 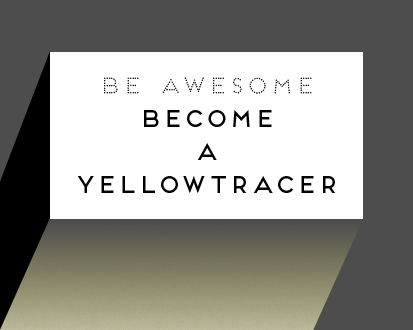 The concept for is sublimely simple but still powerful in its dig at modern undercurrents of misogyny. 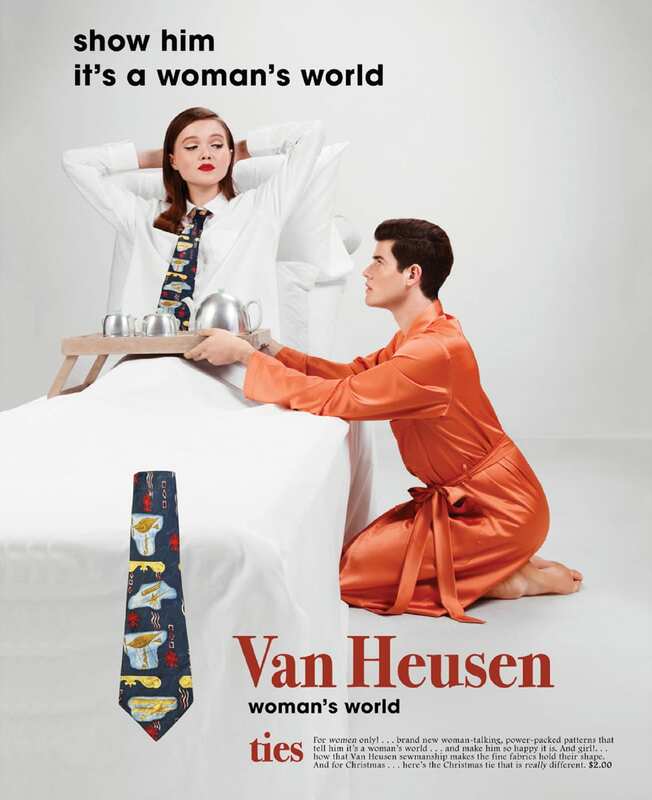 ‘Show him it’s a woman’s world’ reads one recreation of a Van Huesen patterned tie campaign. 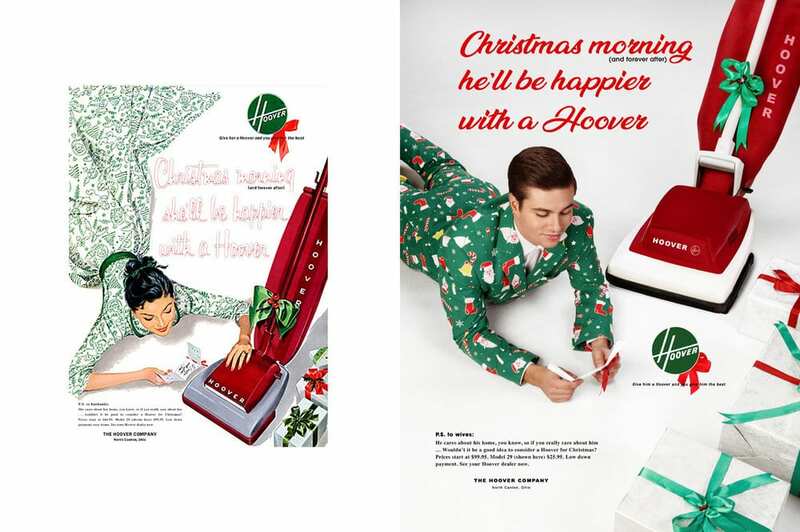 Meanwhile ‘Christmas morning (and forever after) he’ll be happier with a Hoover’ is splashed across a man in ridiculously neat festive pyjamas. 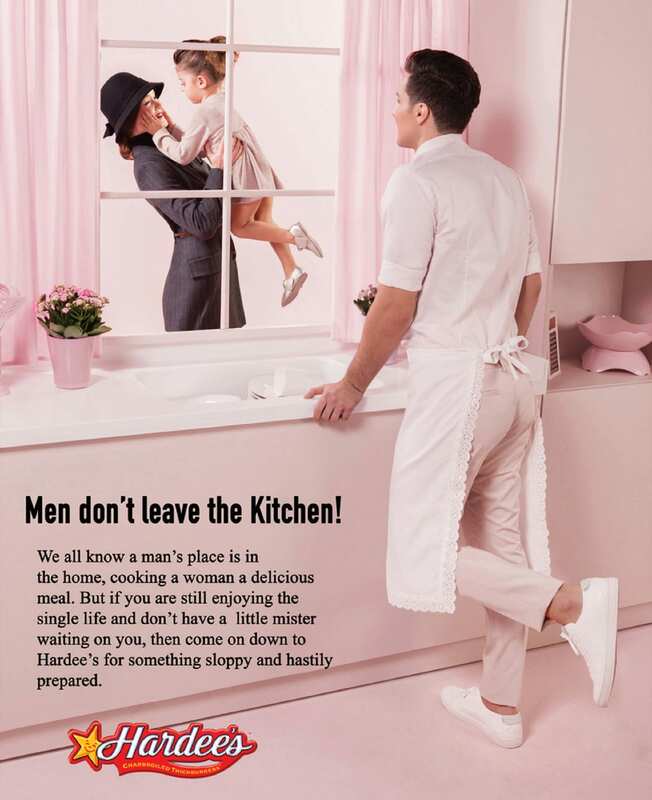 Yep, we’ve come a long way from sanctioning women’s time to household chores, chicken dinners, and child care, but maybe Eli’s point is that role reversal still feels pretty abstract—especially in advertising, and even if (some) husbands and boyfriends do cook delicious meals and do the dishes these days.